Would you like to visit my Icelandic home? Are you interested in the Icelandic Westfjords? Would you like answers on questions about Iceland? Helga is inviting you to a cozy time (also in the evening) in her own home. You will get a talk on the Icelandic Westfjords and answers to all your questions. My Walks you can find here on the left and also Sightseeing Tours (day tours). Here below you will find other shorter Activities and Hikes, which my friend companies offer. Their guides are experienced and security conscious. Furthermore I can rent a car for you if you want to explore the area on your own. I will gladly book this for you too. The Kayak Company offers a lot of interesting Tours both for beginners and experienced kayak driver. Kayaking gives you the opportunity to experience the fascinating landscape of the Westfjords from a new impressive viewpoint. 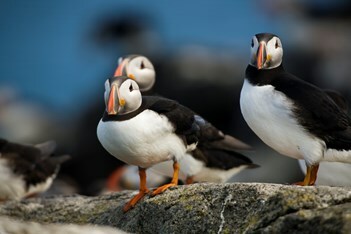 Already on shorter trips you can observe sea birds and seals in their natural habitat. On the longer tours whales and dolphins are sometimes seen. The sightseeing safari tours from Ísafjörður town offers a magnificent view over the surrounding landscape from the sea side. Time for photo shooting is included. Depending on weather conditions the route differs and will in each case be an unique adventure there you can also experience sea birds, seals, whales or dolphins. 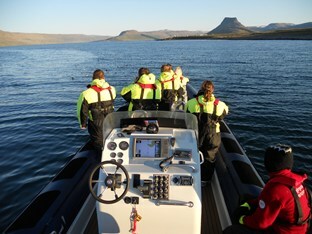 On this tour you get a unique opportunity to experience the raw nature of Ísafjarðardjúp bay from the sea. The bay offers you breathtaking scenery, great history and rich with wildlife where seabirds, whales and seals can be observed in their natural habitat. The beautiful island there you can see puffins, eithers and other sea birds and get information about the time when people still lived there. On the island you get a guided walk and coffee/tee and a taste of traditional food. Always you get a private and personal Tour (for individuals and groups). It is an experience be on horseback enjoying the landscape and the friendly Icelandic horse. Your Guide will have a Gopro camera mounted on his/her helmet so your tour will be documented for your pleasure. Also you can visit horses there, like watch, feed or pet them. The Hornstrandir Nature Reserve is the northern part of Westfjords and a very special place. The only way to get there is by boat. Since early in the fifties here only in summer saison people staying there, hiking on the old walking trails. The nature is very raw and untouched.